My day started here . . .
. . . with this . . .
. . . and continued here . . . I always like to be first, but in this case it didn’t really matter. This was a Sunday afternoon game. 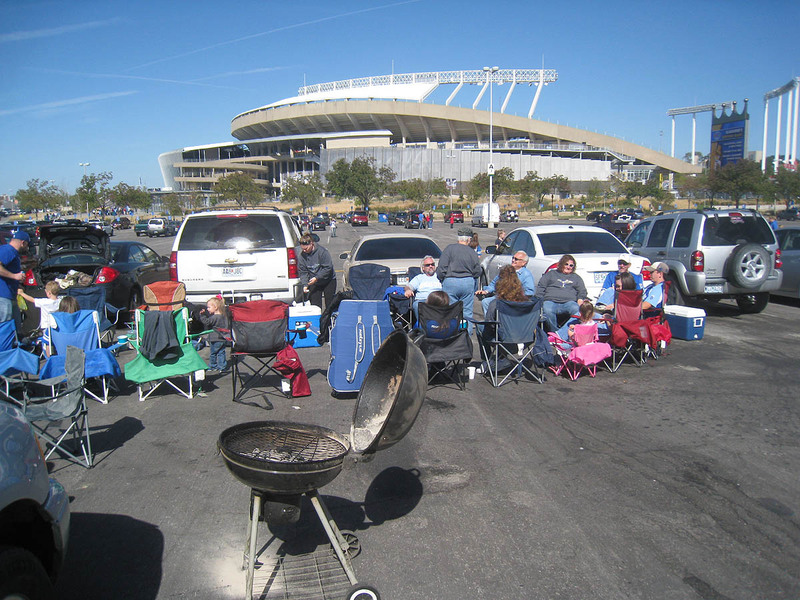 The Royals and Indians had played the night before. Both teams were well out of playoff contention. No chance of batting practice, right? 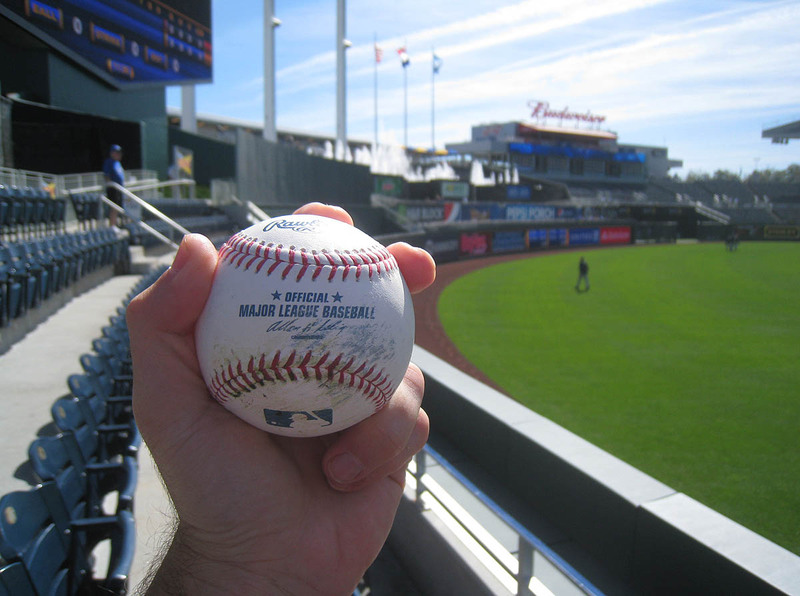 I got an Indians coach to toss me a ball in left-center field . . .
. . . and then BP ended. Just like that. I hadn’t even been inside the stadium for ten minutes, and the Indians started jogging off the field. (WTF?!) 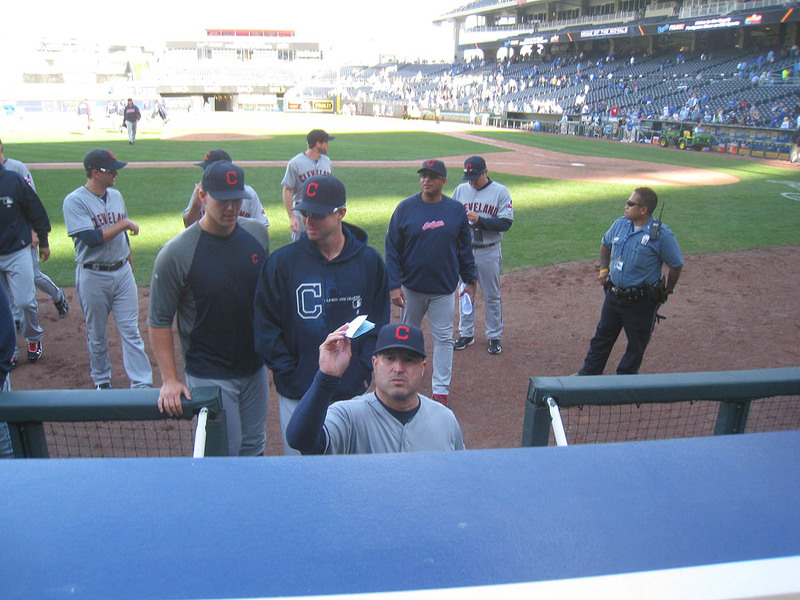 I raced over to the seats behind their dugout . . .
. . . but didn’t get any baseballs from the final few players. There was *no* action for the next hour, so I sat here . . .
. . . and read the previous day’s box scores. 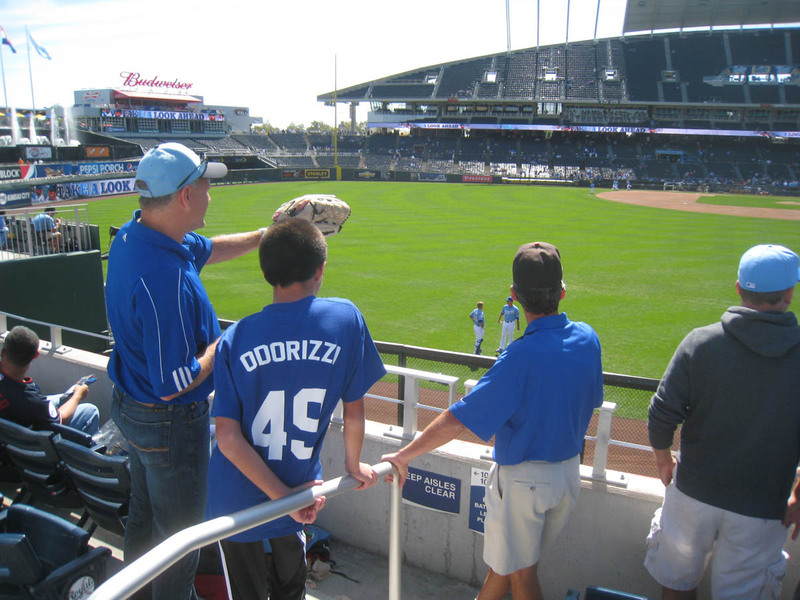 In the photo above, do you see the kid with the “ODORIZZI” shirt? “Odorizzi” might sound like an Italian cleaning product (“Try-a Odor-Easy inna our new-a zesty lemon-a-lime scent!”), but in fact it’s the last name of a top Royals pitching prospect, who was going to be making his major league debut. Jake Odorizzi. Remember that name. He’s a former first-round draft pick out of high school by the Milwaukee Brewers — supposed to be the real deal. I almost skipped this game, but once I learned about this guy and heard that he was going to be starting, I decided that I had to be there. I wonder what was going through his mind. 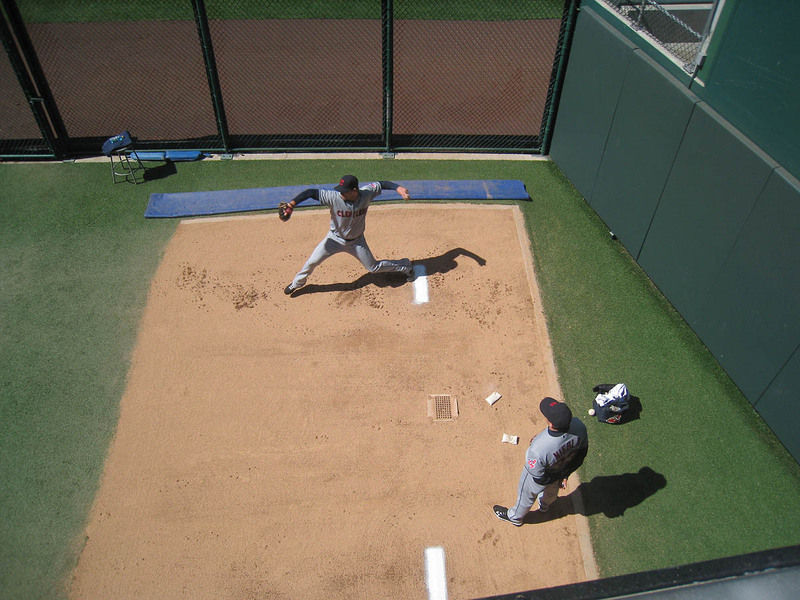 I would’ve stayed in left field and watched him throw, but my odds of getting a toss-up seemed better on the Indians’ side, so I headed to the other bullpen. I kept that ball in a separate compartment in my backpack because . . . who knows? Huff might’ve pitched a perfect game, and it would’ve been REALLY cool to know that it was The Ball. 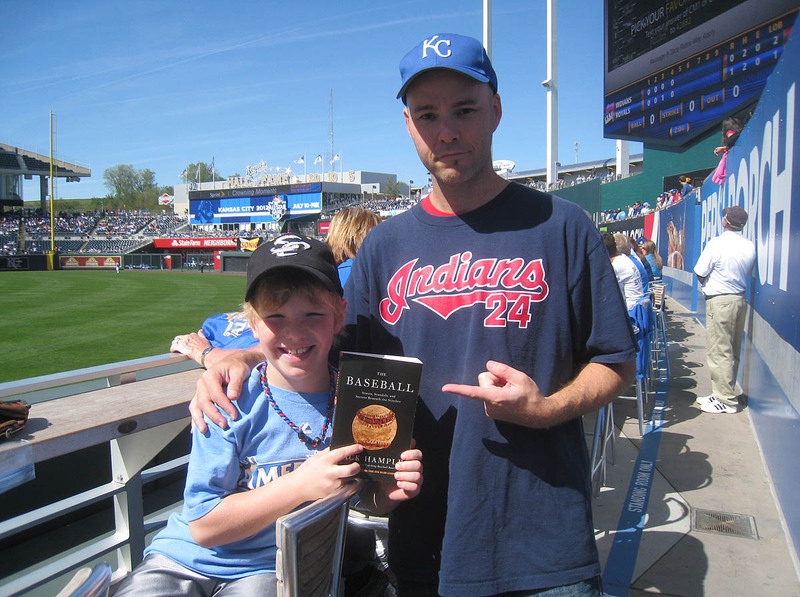 If Zachary looks familiar, it’s because I met him (along with his father and brother) on 9/17/11 at Kauffman Stadium and signed his copy of Watching Baseball Smarter. Remember? Here’s some photographic evidence. Several innings later, Zachary’s father, Tom, offered to take me inside the Diamond Club for a quick tour. He knew that I wanted to stay in the outfield and try to catch a homer, but he also knew that I love exploring stadiums and photographing them for my blog. I was torn, but ultimately decided to take a look at the club; Tom and I timed it so that we went there when the bottoms of both teams’ lineups were going to be hitting. Here he is leading the way . . .
Here’s are a couple rows of table seating . . .
That’s a pretty good spot for foul balls, but why waste time chasing those when you’re in the best stadium for catching home runs in the major leagues? That’s right. You heard me. THE best stadium. Camden Yards is also incredible, and if the attendance at AT&T Park ever drops below 20,000 per game, that’ll be up there too, but whatever. I don’t want to talk about those (or other) places. 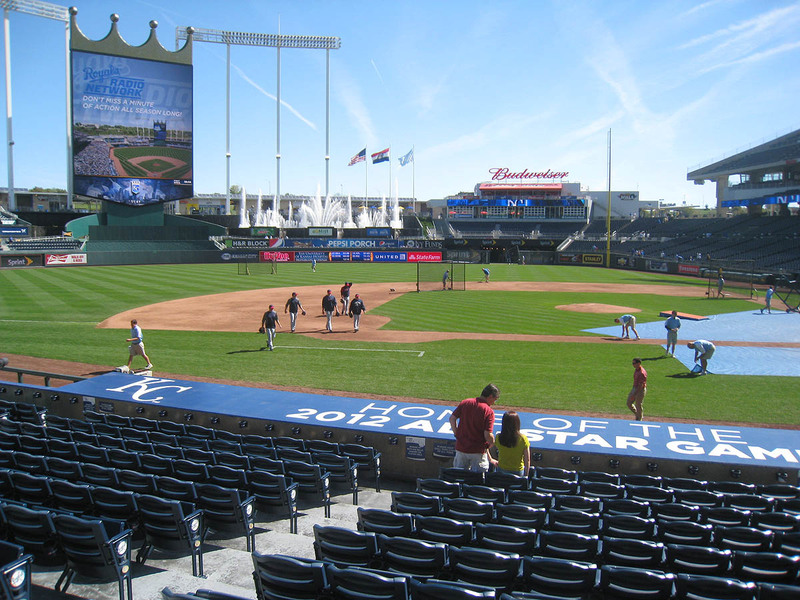 Even though I’ve never caught a home run during a game at Kauffman Stadium, I’m still claiming that it’s the best, and you’ll soon see why. 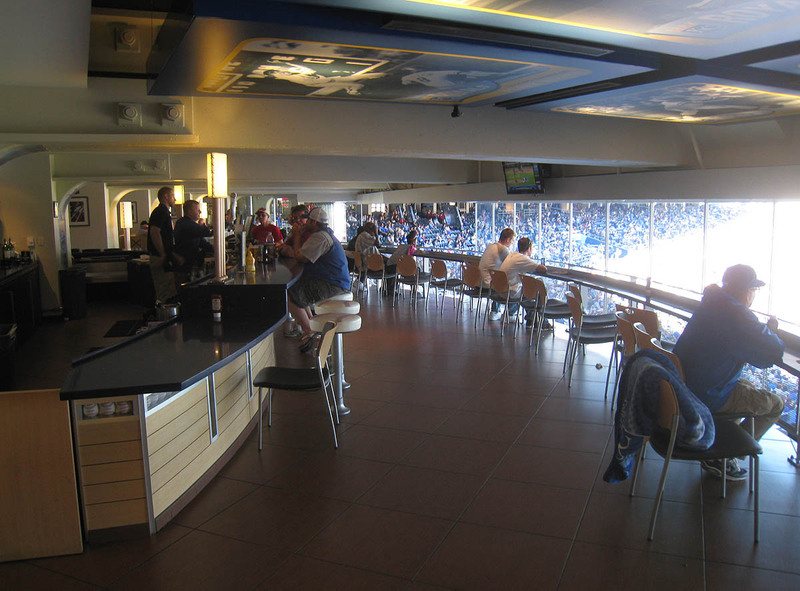 Here’s the Diamond Club bar . 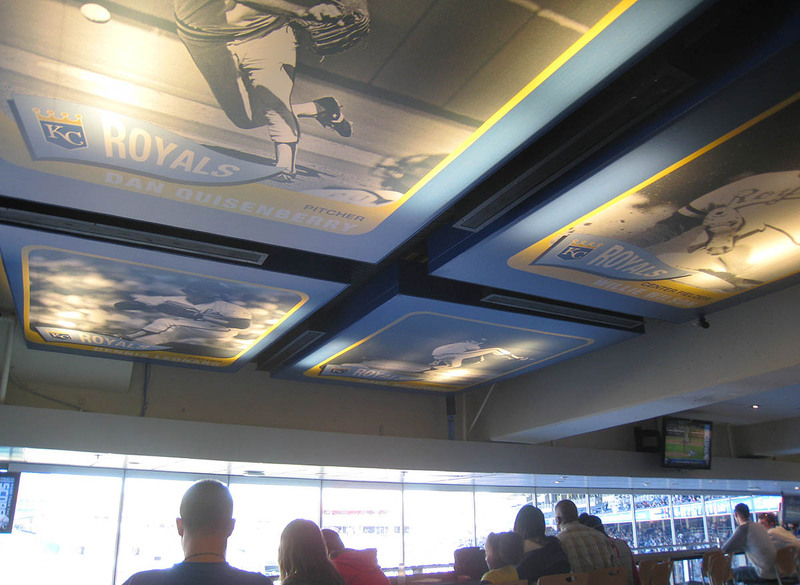 . .
Tom pointed out the baseball card ceiling . . .
. . . which, I’m ashamed to admit, I hadn’t yet noticed. The whole club was extremely basebally (which was cool) and moderately fancy (which made me feel awkward). 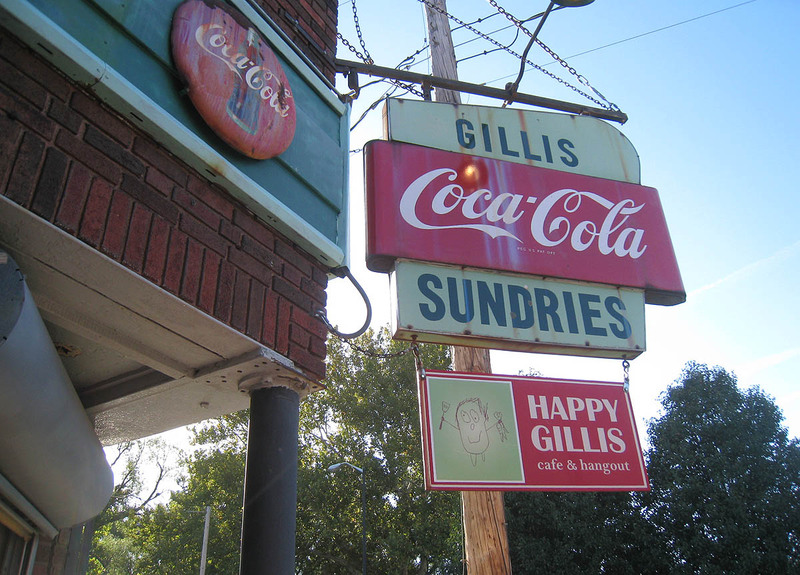 I was glad to get a glimpse, but it’s not a place that I ever need to visit again. And now let’s get back to the outfield . . . 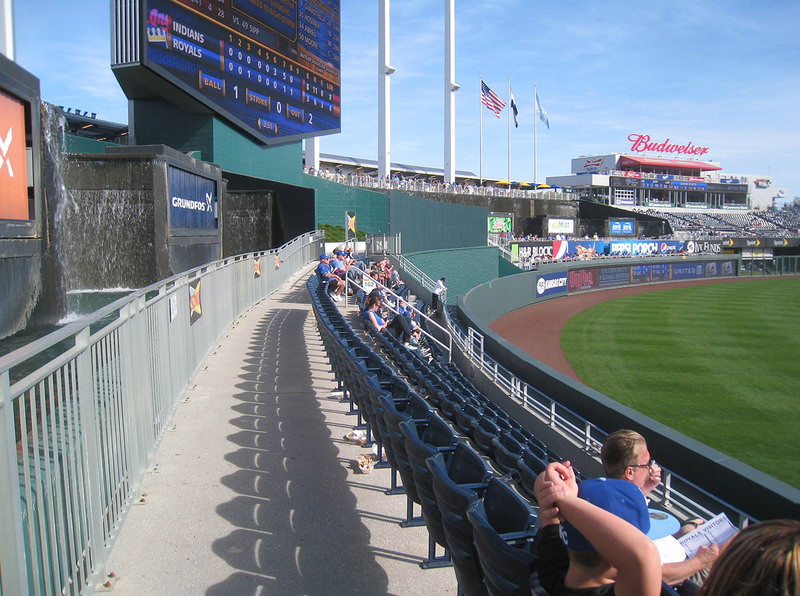 In case you’re not familiar with the right field layout at Kauffman Stadium, there are two levels where fans can hang out. 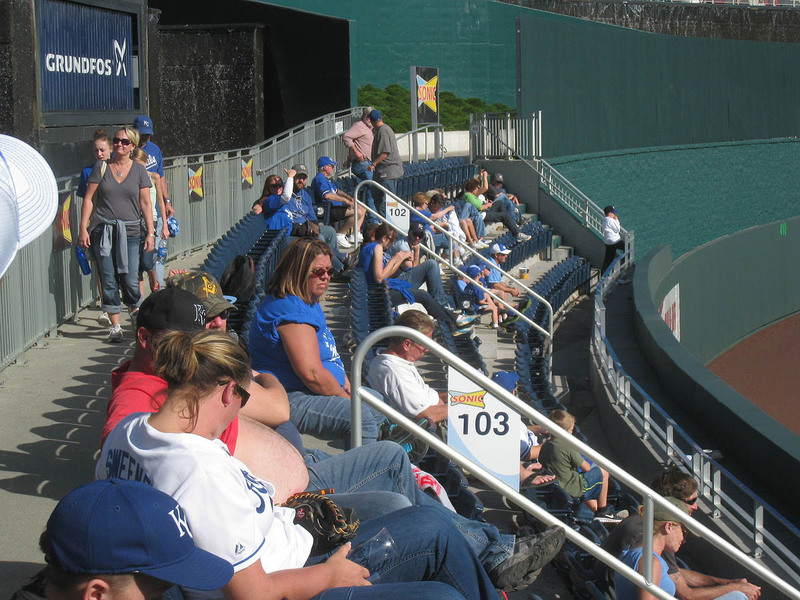 The lower level (which has a row of assigned seats) is directly behind the outfield wall, and the upper level is standing room only. 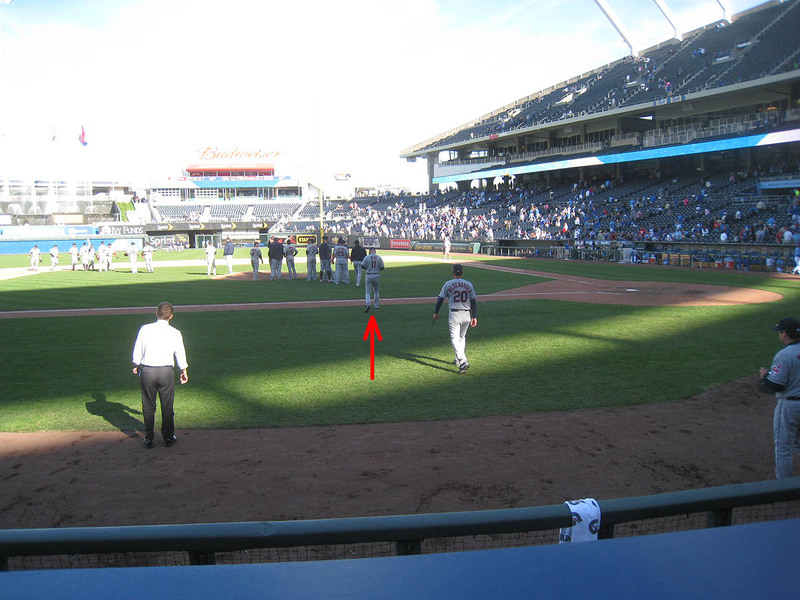 Now that you know that, it’ll make a bit more sense when I say that I positioned myself in right-center on the lower level for all of Alex Gordon’s at-bats. Why? Because he had 49 doubles, and I thought it’d be cool to snag No. 50. This was my view of the field . 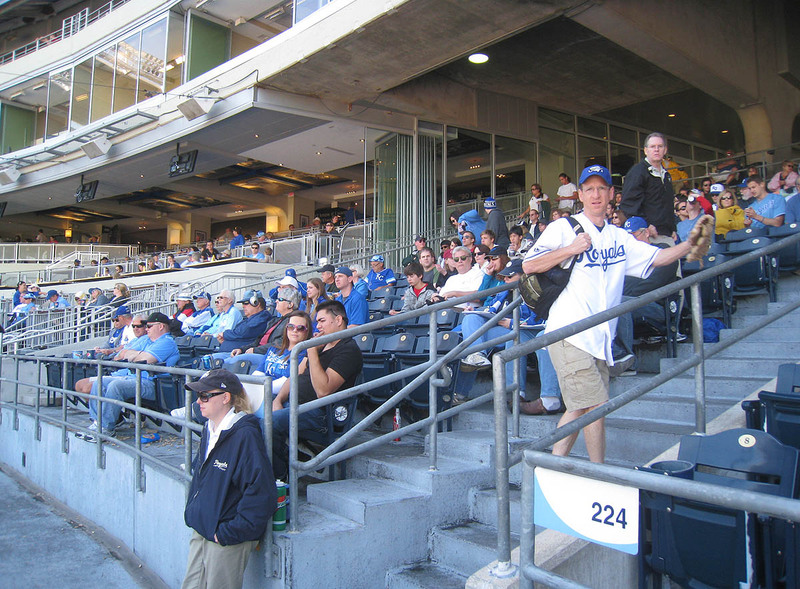 . .
As you can see, there wasn’t much room to run, but I knew that if I stayed on the upper walkway, there was no chance of catching a double. 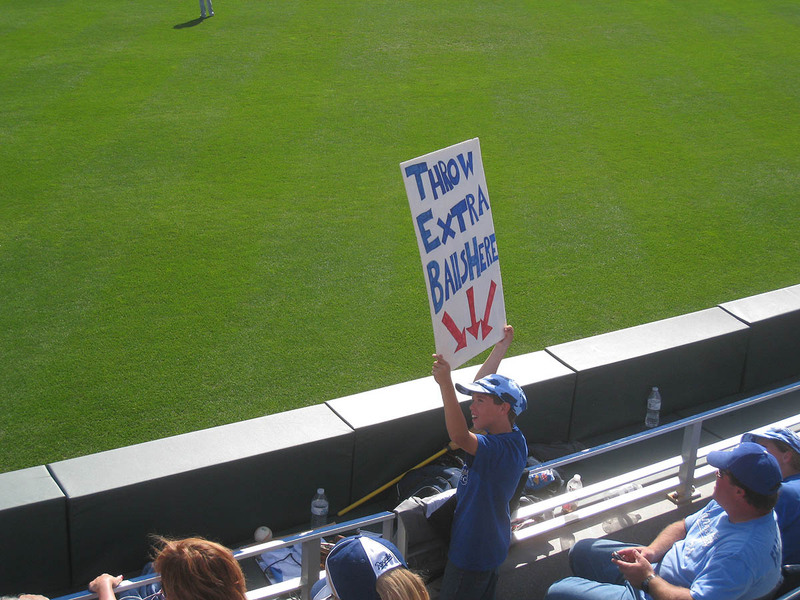 In the 7th inning, I saw a kid with a cute sign . . . I know, I know . 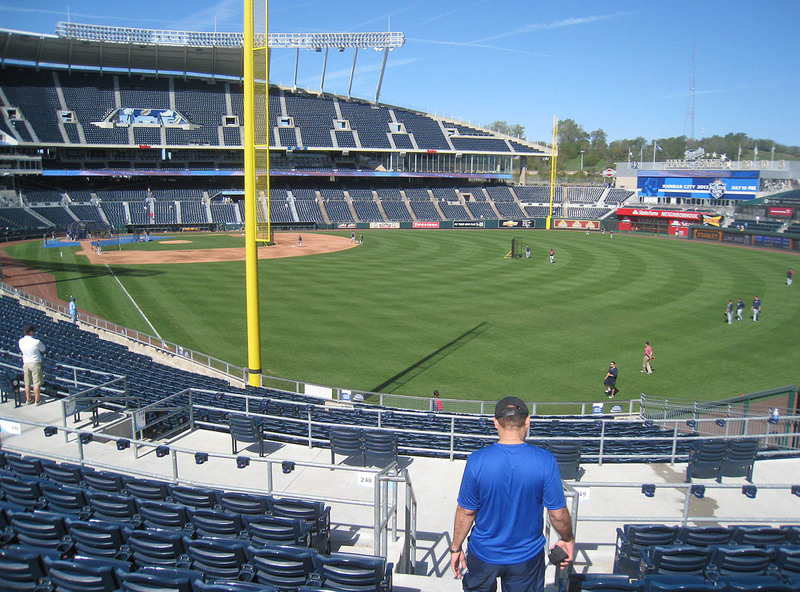 . . it takes a 400-plus-foot blast to reach the walkway, and the Royals have very few players who can actually hit the ball that far, but hell, that’s what visiting teams are for. 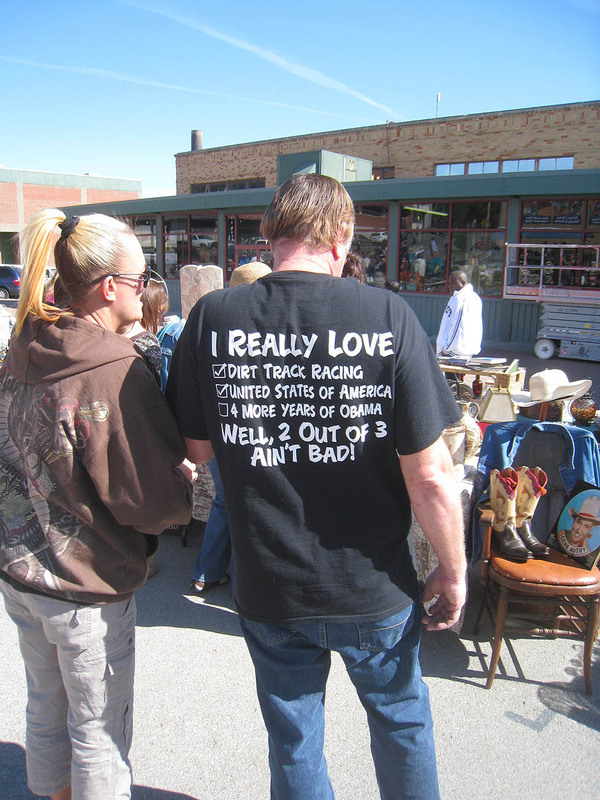 (Just not the Indians.) 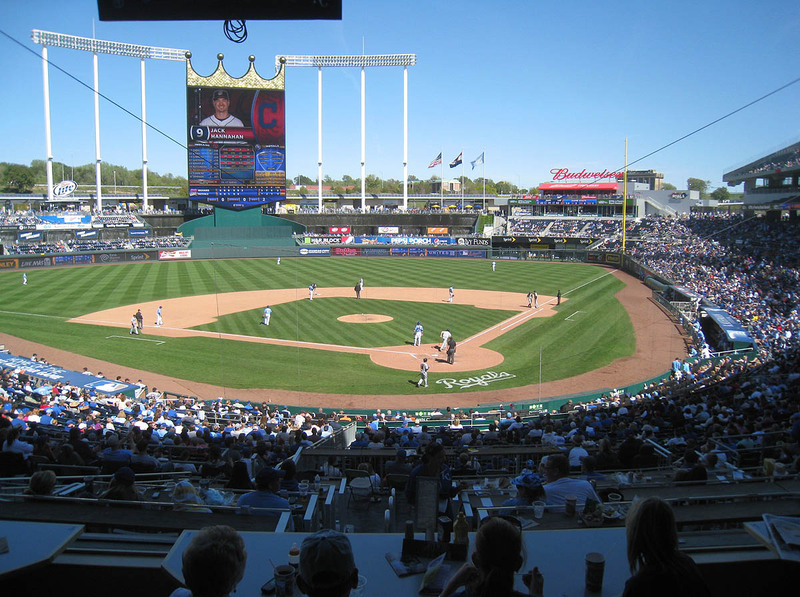 Catching home runs is all about having room to run, and when the attendance is low at Kauffman Stadium (which, let’s face it, is pretty much always the case), it can’t be beat. Yes, okay, the Royals were getting blown out, 15-4, and it was September, and the game meant nothing, but still. To have THAT amount of room in an area that’s well within home-run range is practically unheard of. 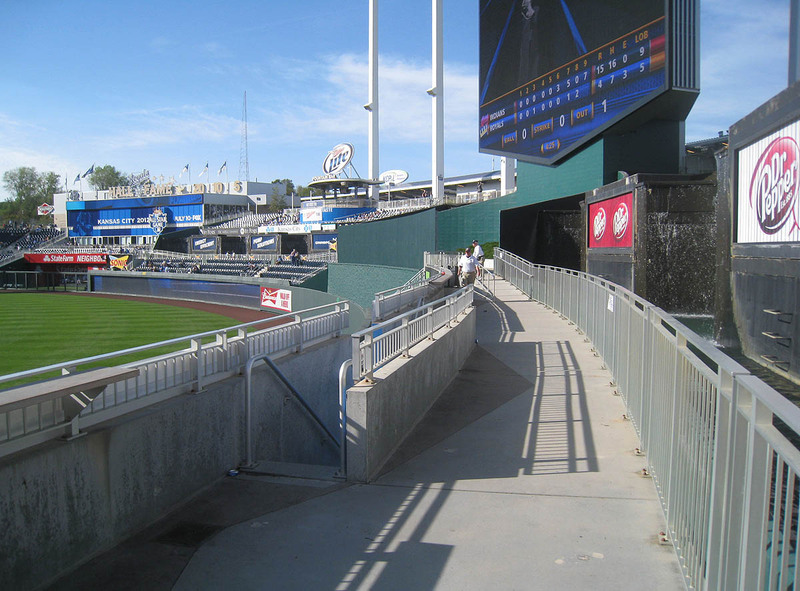 I suppose Coors Field also has to be included in the Top Few stadiums for home runs because of that absurdly awesome “handicapped” aisle directly behind the outfield wall, but I’d still take Kauffman over Coors in a heartbeat. Remember those dead crickets that I mentioned in my previous entry? 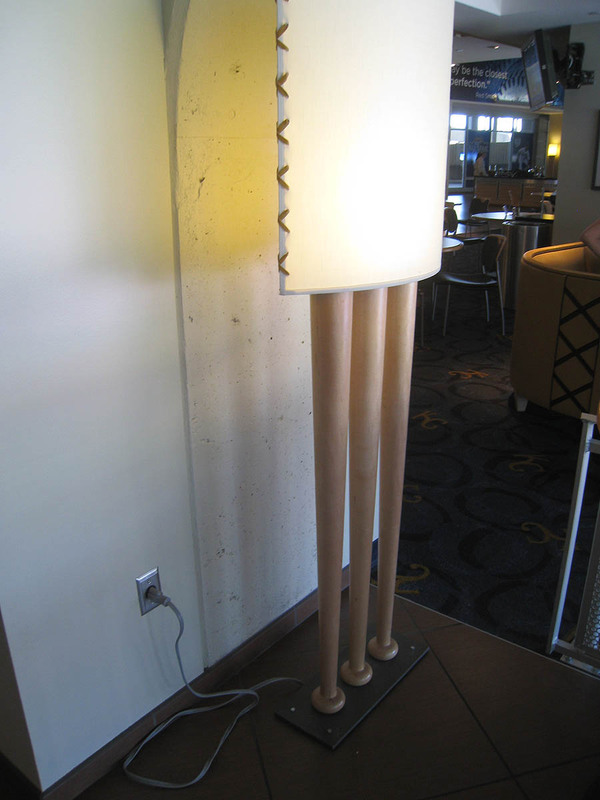 Here’s a photo of them . . .
. . . which I’d like you to click for a closer look. Go ahead. Do it. Click the photo. They won’t bite. They’re dead. And it’s nasty. 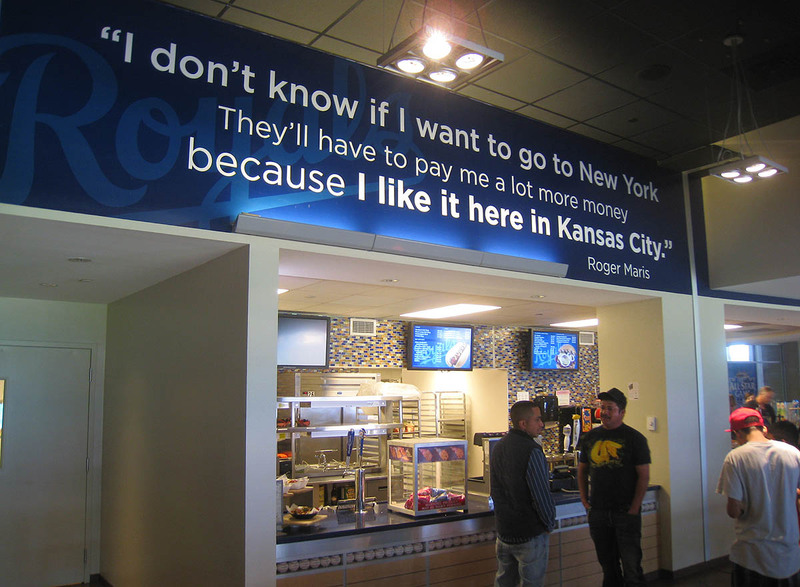 And I’d really like to see the Royals do something about that. Oh, I forgot to tell you about our man Jake Odorizzi. Given the fact that the Indians scored 15 runs, you’re probably thinking that he got lit up, but that wasn’t the case. Yeah, he took the loss, but he started the game with five scoreless innings before giving up three runs in the 6th and getting pulled. Not bad. I should also mention that there were three home runs during the game — one by Carlos Santana that landed in the right field bullpen, another by Santana that scraped the right field foul pole, and a 437-foot blast by Adam Moore that I sorta/almost (but not really) snagged in left field. Click here for the video highlight, and you’ll see me running along the walkway in front of the fountains. 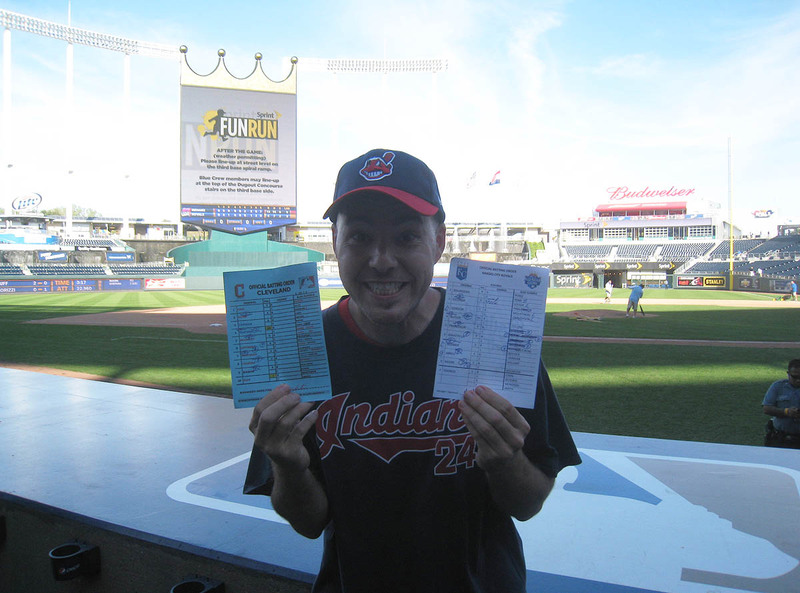 Rather than going for an umpire ball after the final out, I went to the home-plate end of the Indians’ dugout and asked manager Manny Acta for the lineup cards as soon as he poked his head out. Here he is walking onto the field . . . Here I am with them . 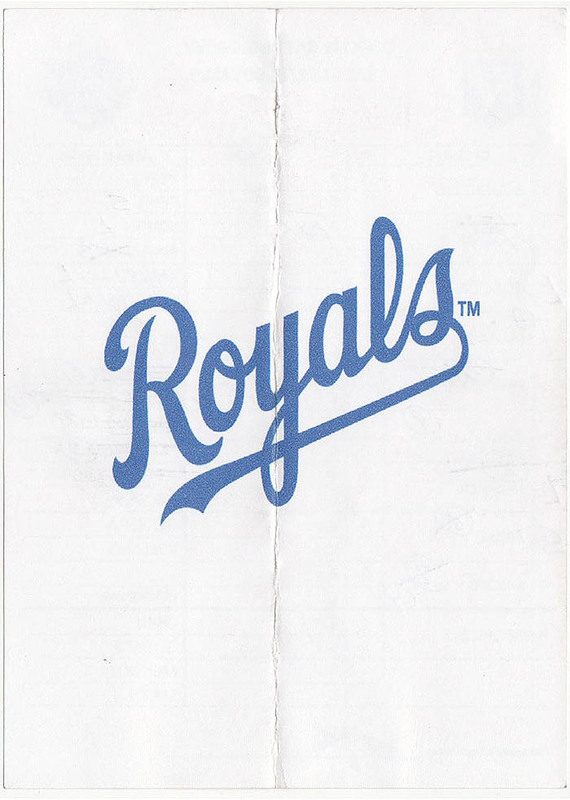 . .
How cool is that All-Star Game logo on the upper right corner of the Royals’ card? How about the modified MLB logo on the upper right corner of the Indians’ card? 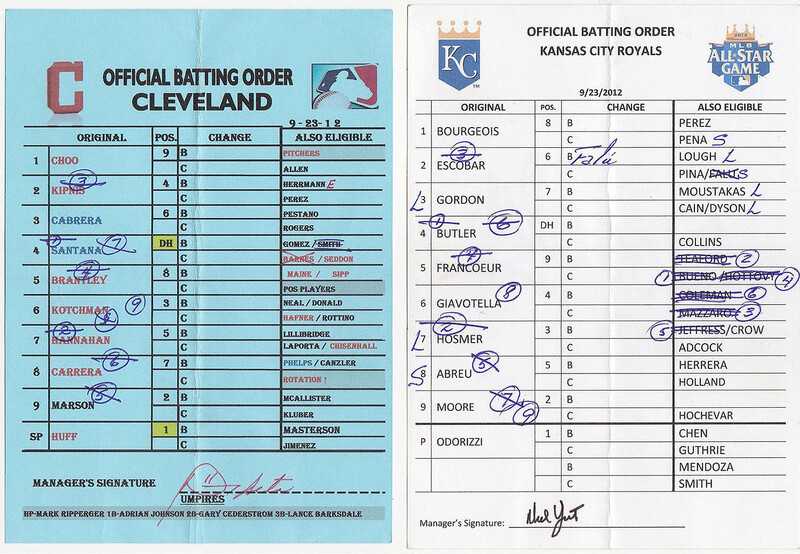 What about Manny Acta’s artsy signature or the fact that these cards are from Jake Odorizzi’s debut? That’s the end of the story from Kauffman Stadium, but keep scrolling past the stats for a few more bonus photos . . .
• 585 balls in 73 games this season = 8.01 balls per game. After the game, Tom (and Zachary) gave me a ride back to Robin’s mother’s place — very kind of him given the 20-minute duration of the trip. And then? 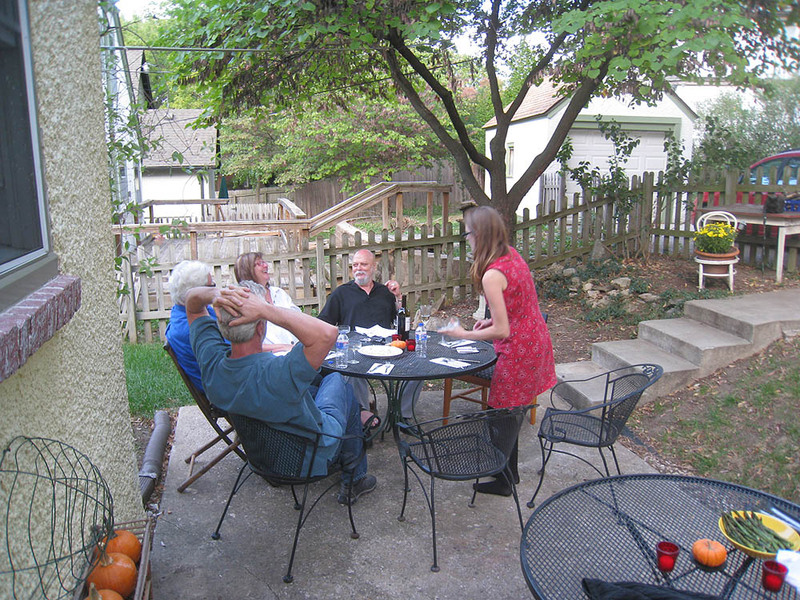 He and I (and Zachary) said our goodbyes, and then it was time for an outdoor dinner with Robin and her parents and a few of their friends. 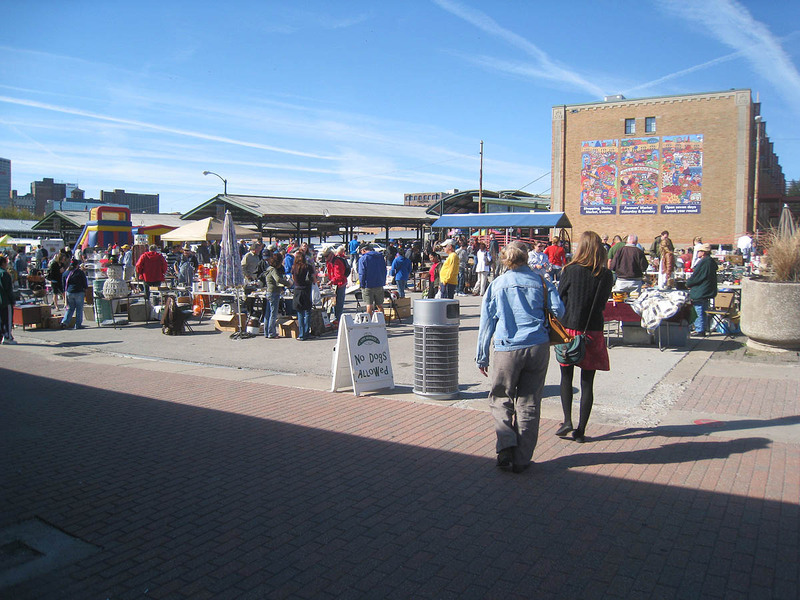 Here’s what it looked like on the patio . . . The salad had mixed greens, cherry tomatoes, cucumber, avocado, and bacon. The whole-grain bread had been baked earlier in the day by Robin’s father. The asparagus had been drizzled with olive oil and then grilled. 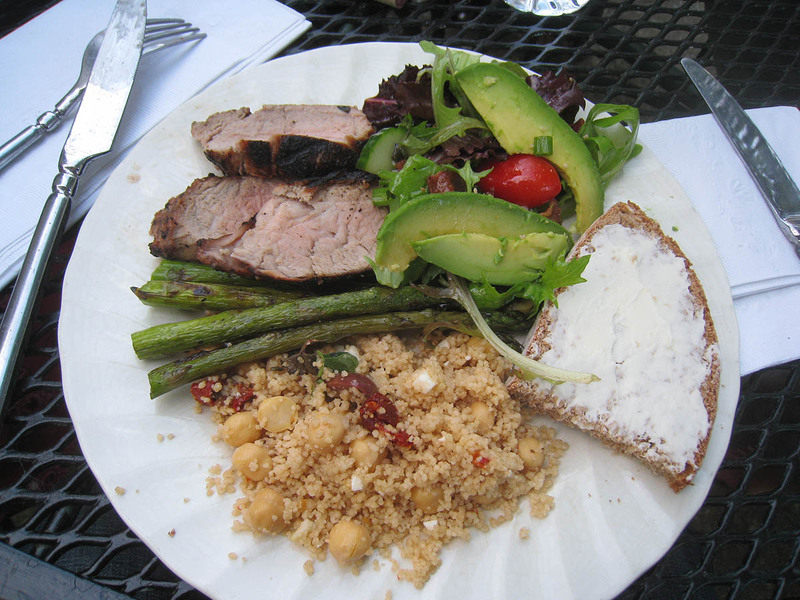 The couscous had sun-dried tomatoes, olives, chick peas, and feta cheese. 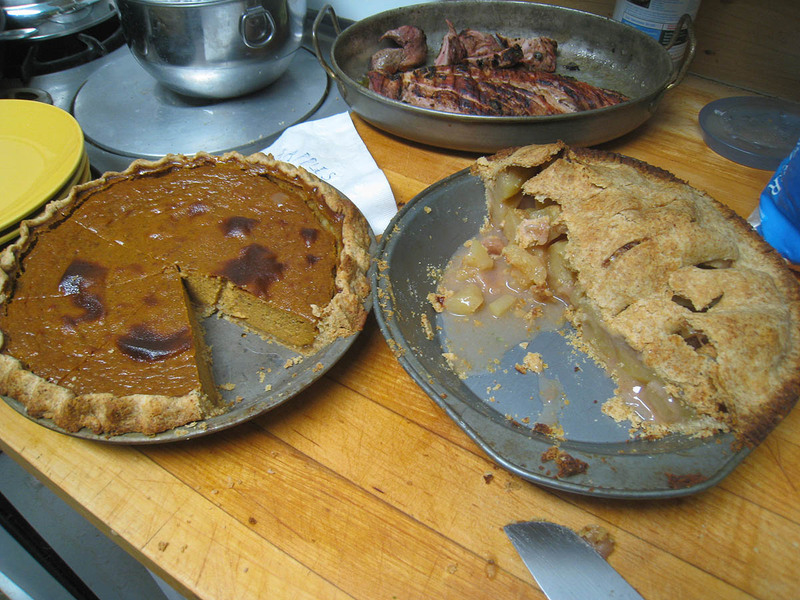 Robin’s mother baked those — pumpkin on the left and apple on the right. 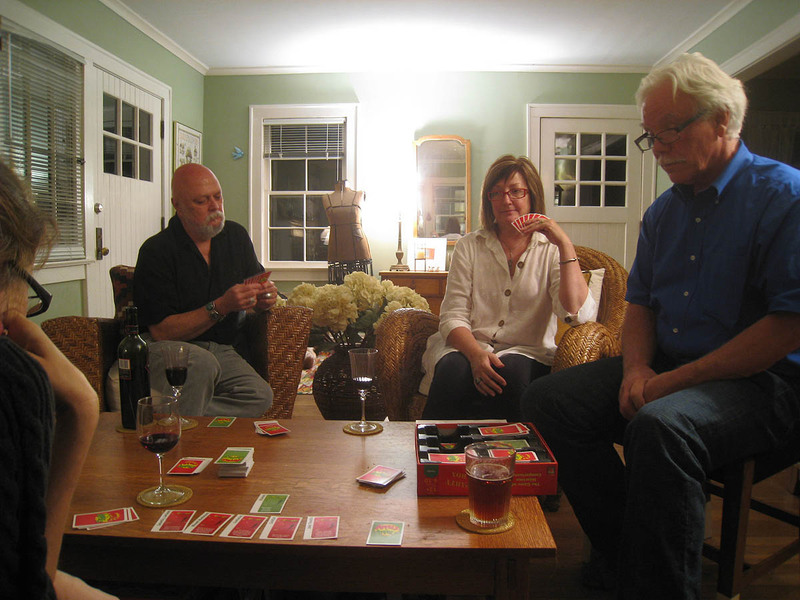 After dinner, there was a fierce game of Apples to Apples . . . So you didn’t get ANY of the home runs? I thought you might have gotten one of Santana’s tossed up to you. Zachary and I had a great time visiting with you at the Odorizzi debut. Sorry for the long lines in Right Field when you first arrived. 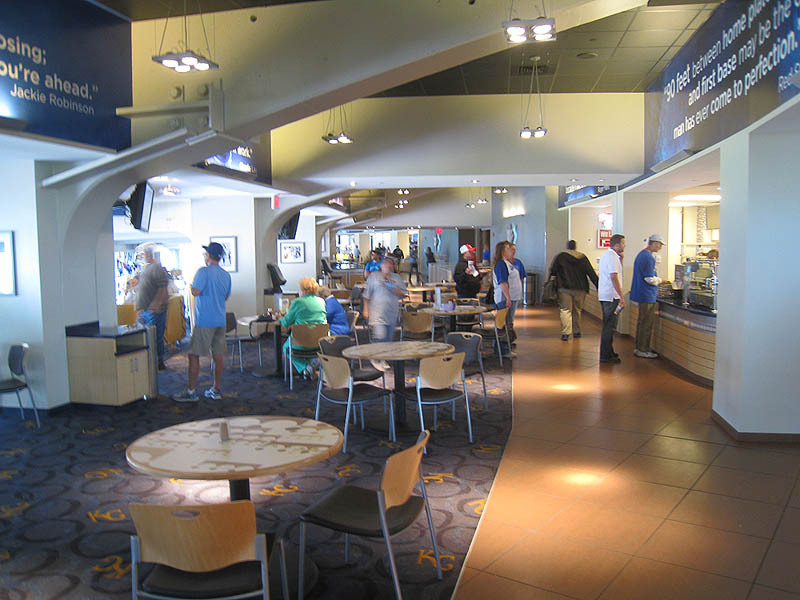 In the future, Gate E usually has the longest ticket lines as that is the only ticket window available to purchase their General Admission Miller Lite Fountain Seats. 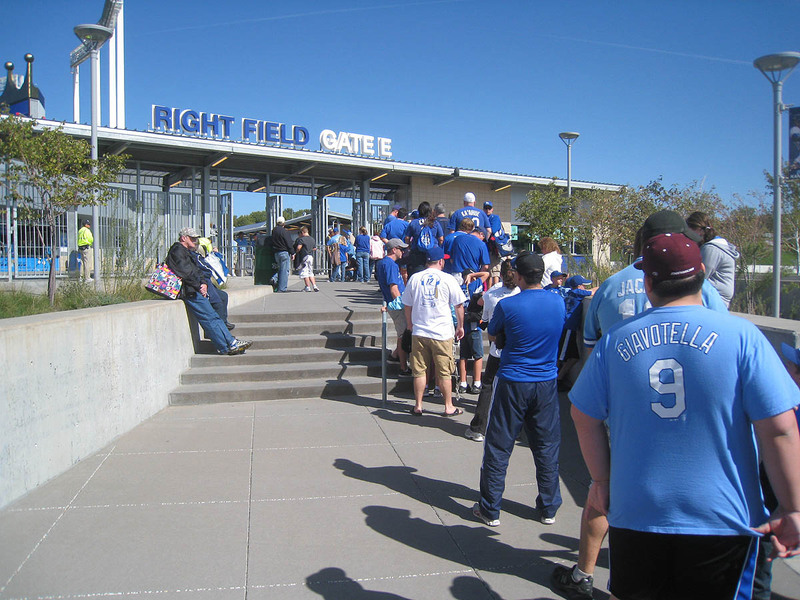 It’s a first come, first serve walk up ticket opportunity sold only at Gate E prior to each game. So, the lines can get long over there if you don’t already have a ticket in hand. * Nice job, again, snagging those lineup cards! 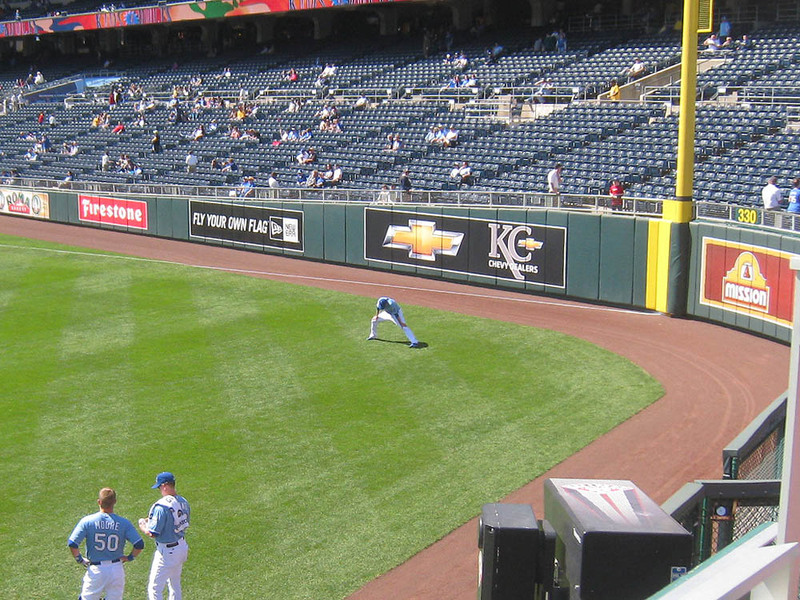 Kauffman is great. 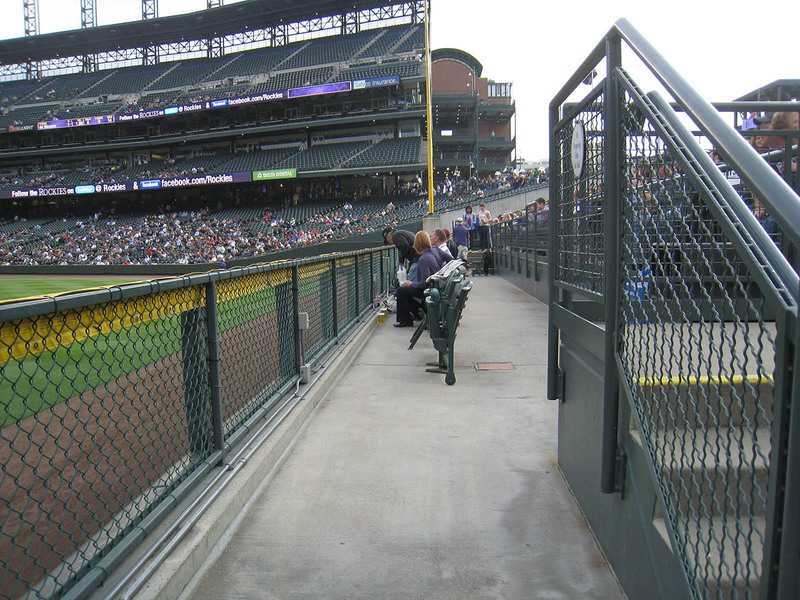 But I would take Dan’s seats at Coors anyday over Kauffman’s outfield. I have zero homeruns to my credit, but I’ll point to Dan’s 15 million game homers (and Robert’s 8 million) as support for my statement. (Note: numbers may be exaggerated). 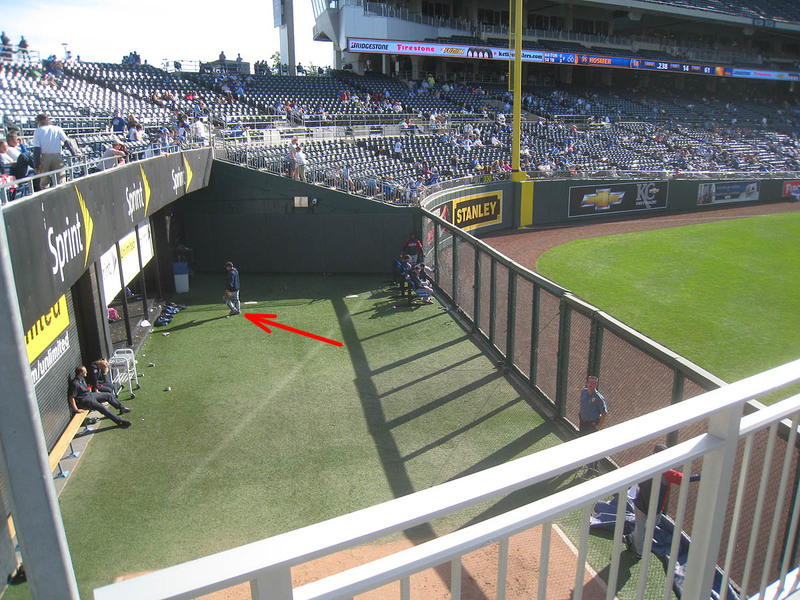 Here are the main points of my reasonsing: (1) The Coors handicap aisle is right on the field and directly over the homerun wall (heck, it would be paradise for Jeffrey Maier (or however you spell his name)) whereas the walkways with all of the running room at Kauffman are set back from the field, (2) homeruns at Coors can fly over you into the bleachers and ricochet back to the handicap aisle whereas at Kauffman homers over your head will sink to the bottom of the fountains (a/k/a Cricket Lake), (3) although the competition seems to be low, anyone can run into the Kauffman cross aisles to compete for a homerun whereas no one in the bleachers can enter the handicap section at Coors (I saw Barb boot kids out as they tried to get in the handicap row in the 8th and 9th innings), and (4) Coors is a homerun park and Kauffman is not (at least that is my perception). Nice Job getting those lineups! Anyway, I went to the O’s – Redsox game last night!.It was GREAT game… Best of the season. The atmosphere was AMAZING, which as a baltimore fan, has been very rare over the last decade.. 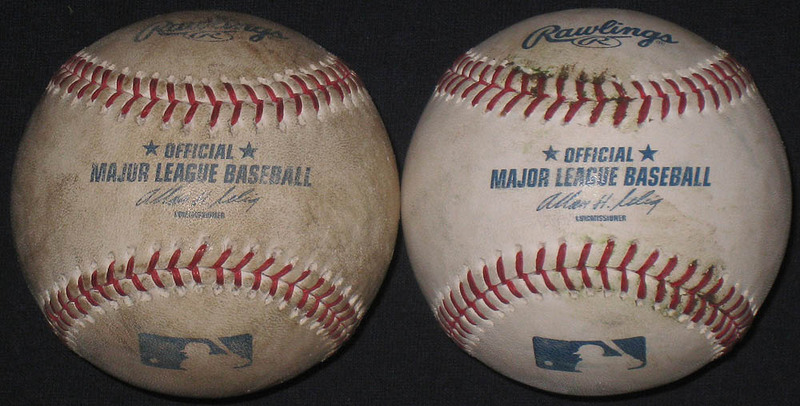 Anyway, I snagged two balls at BP. One I caught, and one landed in the empty seats and I walked to it. There was one ball that bounced off the warning track, but I noticed this little kid (He was like five) right behind him, and I let it go… It landed right in his hands! Made his day. 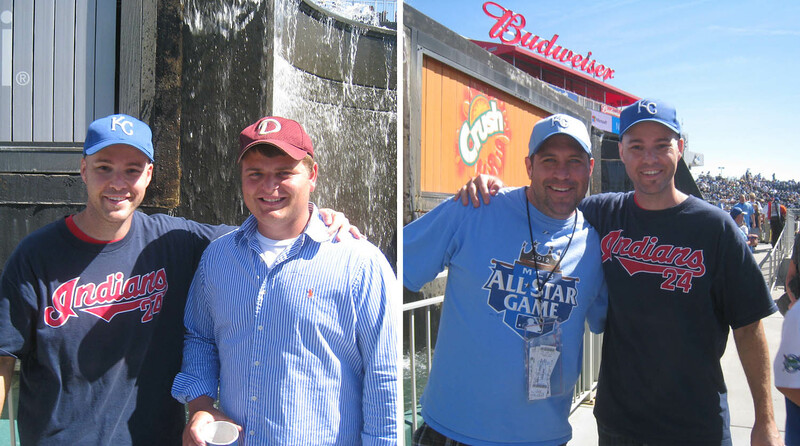 Sorry Zack, to clarify, this guy apparently comes to a lot of game at camden yards. how old? is he? Could be Tim Anderson (http://www.mygameballs.com/baseballdata?db=Gu3). 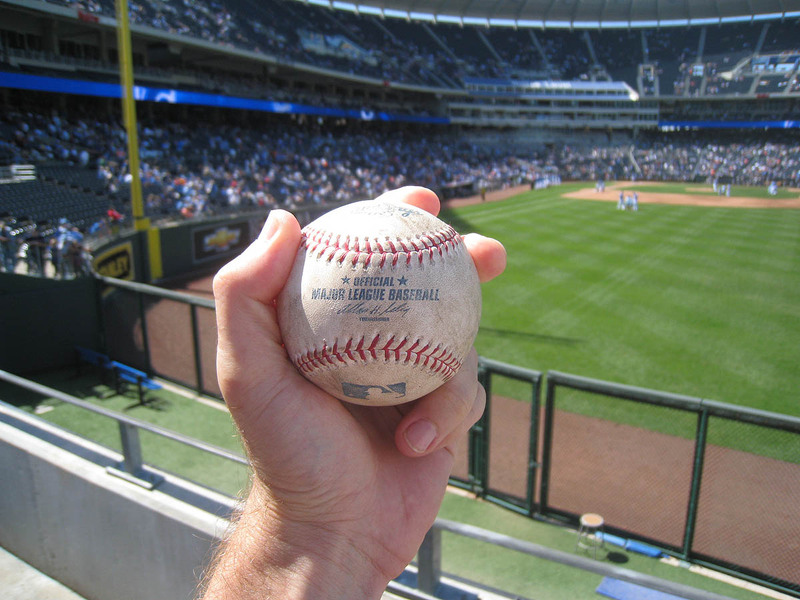 Could be Alex Kopp (http://www.mygameballs.com/baseballdata?db=akopp1). Those are my two guesses. 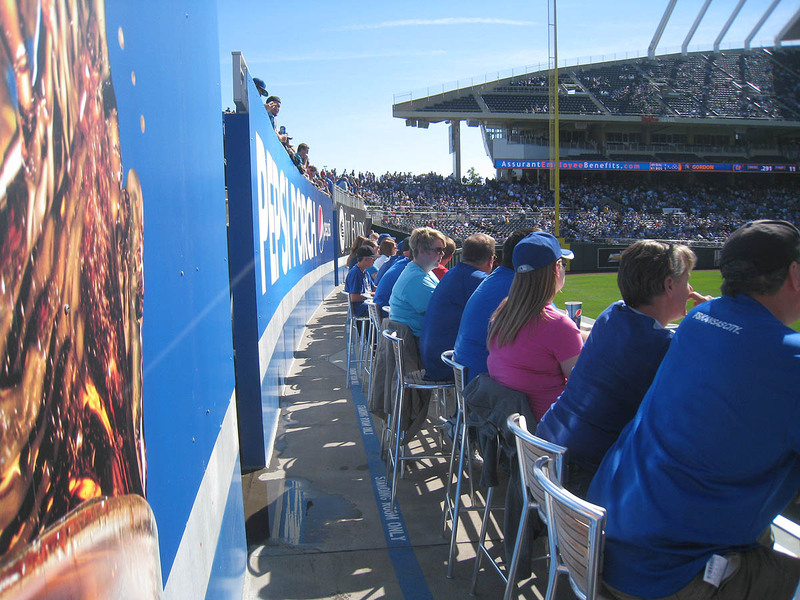 You’ll have to come up to KC for a weekday series next time. 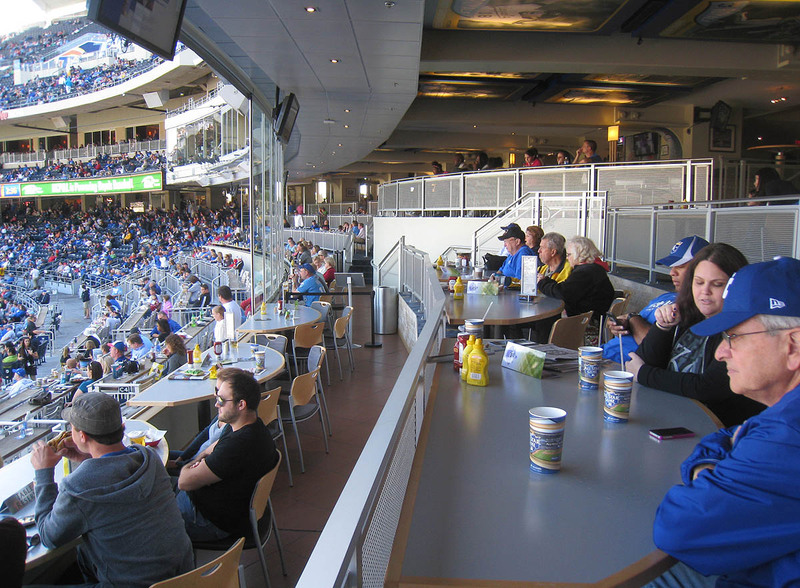 Usually the lower half of the party porch in right field is rented out only on weekends. 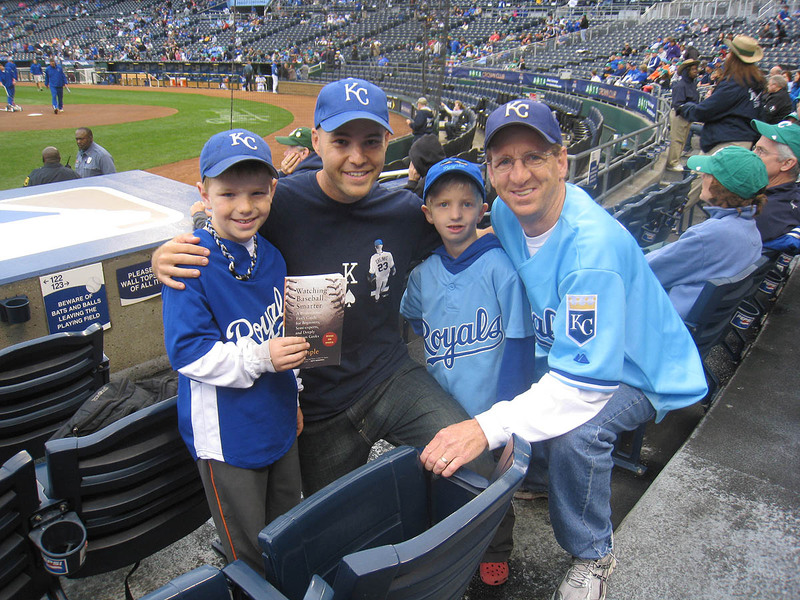 You should email the Royals owner with that picture, then I bet something would get done. 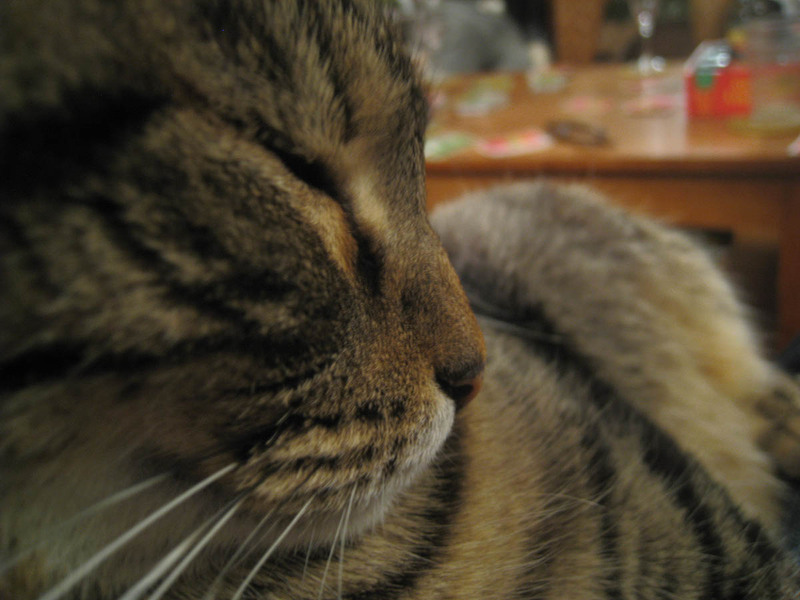 Like I said last post…. 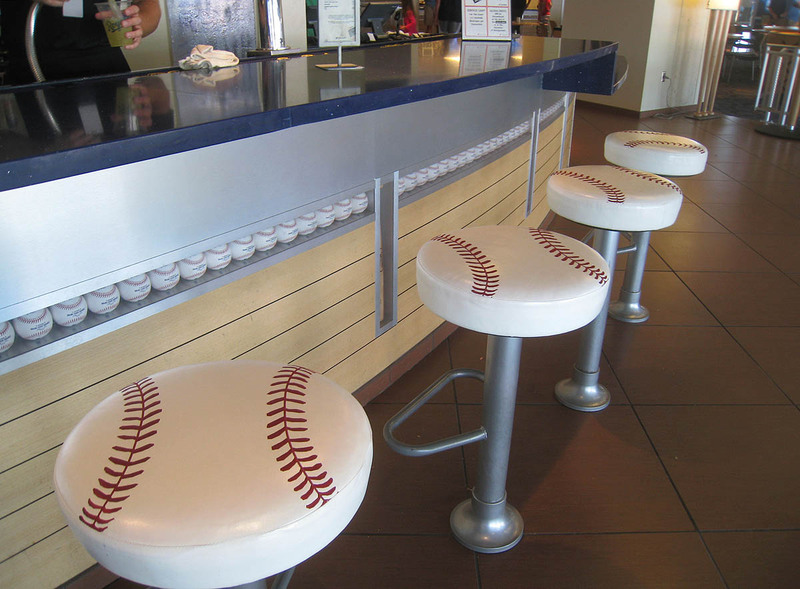 I realllllllllllly gotta get out to some of these ballparks. Sigh. Enjoy Atlanta! The best part of this post was the food. You made me very hungry! What was it 2 or 3 days later Acta was fired? Zack, I am heading to Citi Field on the 3rd of August and I bought tickets in the Promenade Reserved Infield (for way below the face value) but I want to sneak down to center field before the game even begins. Can you make a blog post or give me some tips on how to sneak past stadium security? Thanks. Thanks for the tip on Gate E, but even if I’d known that ahead of time, I might’ve stayed there. I don’t know if I had the time/energy to run halfway around the stadium. Excellent points. I think, though, that *because* Coors is such an extreme home run park, that makes it harder to catch home runs. 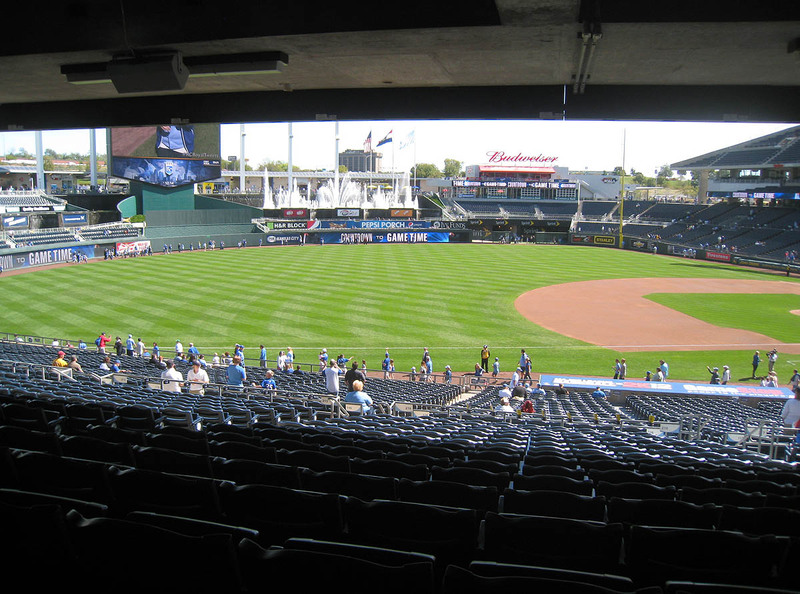 You see, with such thin air and balls flying all over the place, most of the homers land deep in the bleachers, but at Kauffman, that cross-aisle is about as far as players will generally hit ’em, so I’d be right in range. Does that make sense? 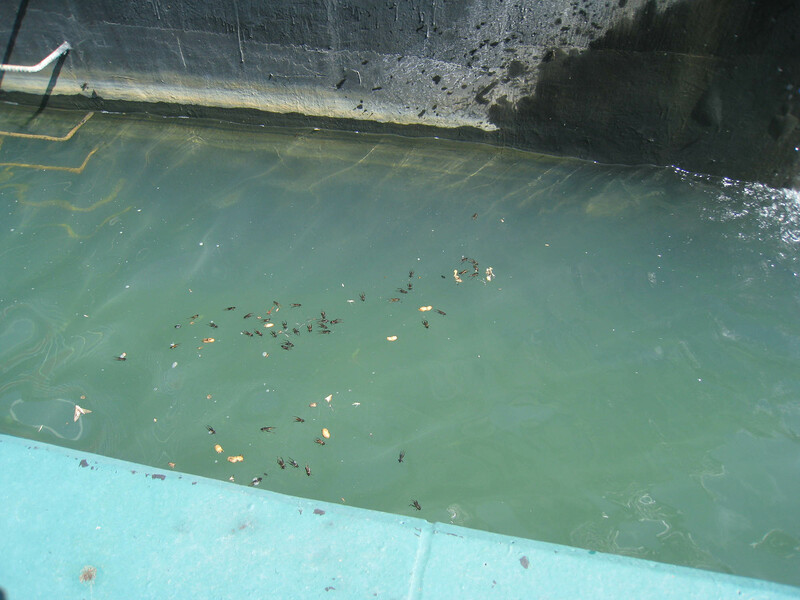 And okay, I’ll admit it, I’m judging Kauffman based on the ability to scoop balls out of the water with a device. If I were there full time, I’d raise such hell about it that they’d have no choice but to change that rule just for me. That game you attended sounds like fun. Not sure which fan you’re talking about, but “Cook & Son Bats” made a couple of good guesses. Can you get Robin’s parents to take time off during the week? That’s the only issue. 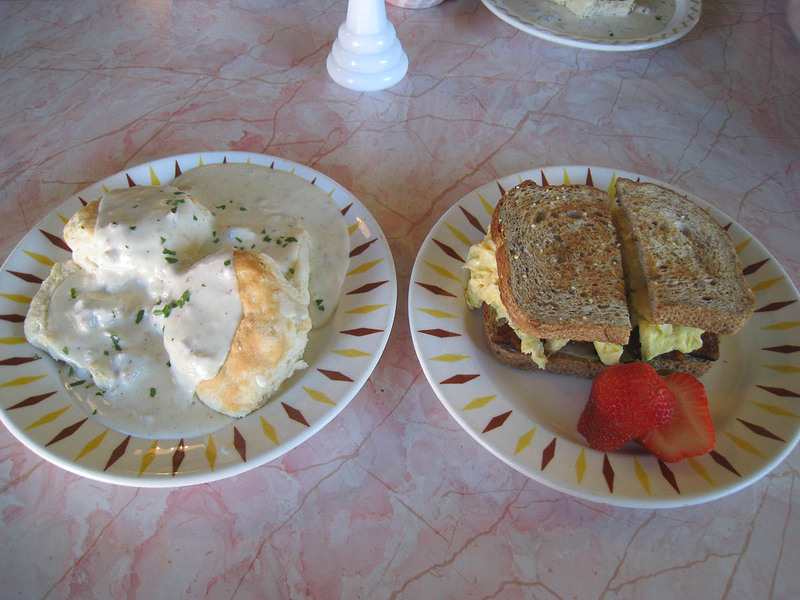 I don’t consider myself a “foodie,” but I do like posting pics of my noteworthy meals. August? You mean . . . next season? 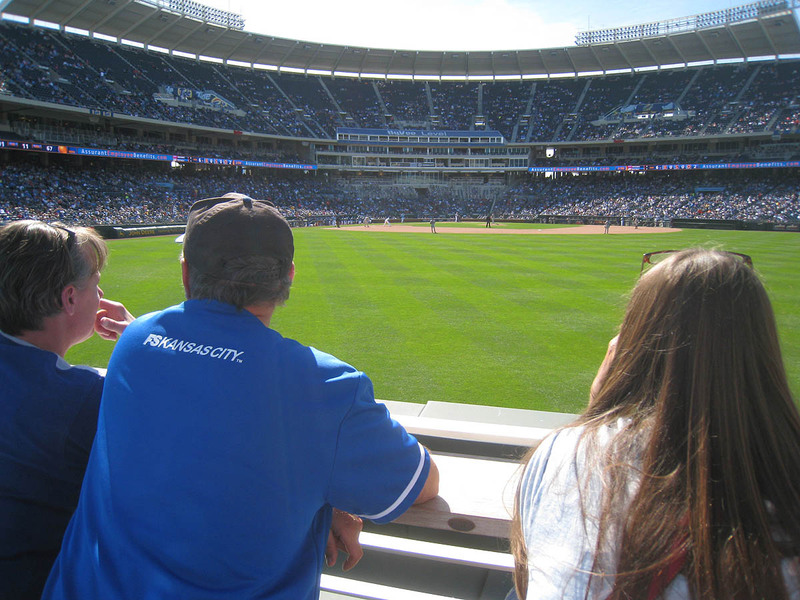 Just go to that section during BP (when the ushers aren’t checking tickets) and then stay there.